Are you want build a collection of guns for hunting or to carry your guns on your person? Or are you interested in some combination of these things? Once you can identify the purpose of your gun collection, the next logical step is to decide if you are interested in any particular sub-category of guns. If you plan to collect guns to display, perhaps you want to focus on limited edition guns. If you want guns to carry, you might have a special interest in law enforcement firearms. Holding a gun in your hand can help you to determine if a gun is right for you. 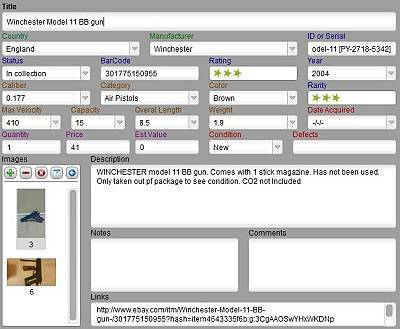 Keep track every aspect of your gun collection with this inventory software. 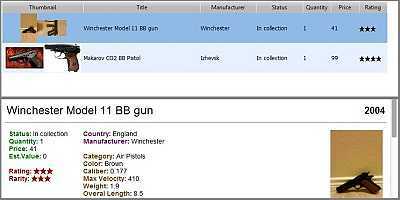 Searchable database has a table lists, cards, detailed view and statistics features that let you to track value of firearms categories, or your entire collection. Print hard copy reports using rich reporting tools, customize the screen appearance, modify or add any fields.